Today, I blog to you live from NCTE 2017! As I sit, still bringing you reviews from fabulous St. Louis at NCTE, I’d like to continue my quest of sharing great non-fiction titles with you. Today, I visited the Lion Forge booth at the conference, and I was overwhelmed by the amount of diversity in title and the quality of art in the books that I saw. I cannot as of yet speak to the story present in each title, but if the stories match the presentation, we are in for a treat! In the coming weeks, I plan of doing a Lion Forge week of reviews, but I was so impressed with them, I thought I’d give you a Lion Forge title this evening. 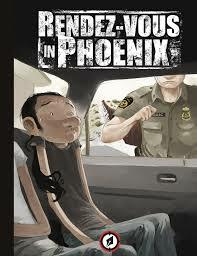 Rendez-Vous In Phoenix is a physically over-sized, on the (page number) short side, non-fiction book that tells the story of Tony as he desperately tries to illegally cross the U.S./Mexican border in order to meet up with his girlfriend in Phoenix and proceed to Portland, Oregon. The over-sized pages allow for Sandoval to feature and showcase some amazing art. What appears to be mostly marker and watercolor fill large panels that work to allow the reader to experience the vastness of the terrain that Tony and his fellow travelers must explore. And while a quick-read, this graphic novel works well to introduce the idea of personal freedom and its link to immigration. Tony gets captured multiple times attempting to get to Phoenix and his girlfriend. I won’t tell you if he ultimately makes it, but whether he does or not is not a given during the read; Tony Sandoval does a tremendous job allowing the reader to explore that possibility in the back of their mind while focusing on his immediate dangers and adventures in attempt after attempt to cross into the United States. A great addition to any classroom library for grades seven and up, Rendez-Vous In Phoenix tackles some topics that may divide an audience, but its construction never asks for anger or dismissive narrative. This book is just an honest portrayal of what it means to reach for your dreams in the face of obstacles.